This interesting surname is of English locational origin from one of two parishes called "Acaster" in Yorkshire. The placename is recorded as "Acastre" in the Domesday Book of 1086, and derives from the personal name "Aca" plus the Old English pre 7th Century "ceaster" meaning a city or walled town, originally one that had been a Roman station; hence "The Roman fort of Aca". The surname is first recorded in the early 14th Century, (see below). Recorded in the Poll Tax Returns of Yorkshire (1379), are Robertus de Acastre and Johannes Acastre. 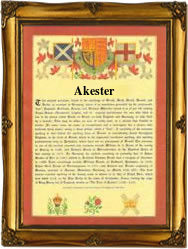 In the modern idiom the surname has many variant spellings including Akester, Akaster, Acaster etc.. Early recordings of the surname from the Yorkshire church registers include; Thomas Aecaster, who married Margaret Wharf on December 2nd 1559, at Gargrave; Jaine, daughter of Thomas and Anne Acaster, was christened on August 31st 1559, at Snaith; Elizabeth, daughter of Mylles Akister, was christened on October 20th 1661, at Aberford; and in the same place in 1697, Isabel Akister married John Cromac. The first recorded spelling of the family name is shown to be that of William de Acastie, which was dated 1319, Freeman of Yorkshire, during the reign of King Edward 11, "Edward of Caernafon", 1307 - 1327. Surnames became necessary when governments introduced personal taxation. In England this was known as Poll Tax. Throughout the centuries, surnames in every country have continued to "develop" often leading to astonishing variants of the original spelling.